Industry growers, golf courses, and country clubs rely on our large-order supplies every year for rich, thick landscapes; vibrant, healthy plants and flowers; and lush, full trees and bushes. Contract sales with volume discounts are welcome. Just call (706) 722-0661. The gardener's best bet is to buy in bulk by the pickup load direct from our base of operations on the Savannah River, just outside Augusta, GA (map). If you can't come see us, look for Bricko products in select garden supply retailers throughout the southeast. KRICKET KRAP 4lb BAGS: Get 'em while you can! Limited supply of the original Kricket Krap organic fertilizer. $10 per 4 Lb. Bag, on-site only while they last! PLANET FRIENDLY-We're all about green! 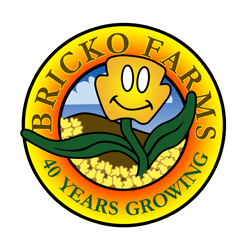 Bricko is an environmentally conscious, privately owned company providing high-quality, safe, horticulture-related products and services. We use recycled materials to the greatest extent possible in a manner which is beneficial to community and global concerns. Reuse. Recycle. Regenerate. GARDEN KNOW HOW by Bill Bricker, Sr. Co-founder and CEO, Bill Bricker, Sr., is widely praised in professional gardening circles as a wellspring of horticulture knowledge. Discover some of his tried and true secrets to growing success in our on-line sampling of Garden Know How.